The stalk of the rhubarb plant ranges from green to dark red and has a very sour flavor with long thin fibers running the length of the stalk. Similar in consistency to celery, rhubarb is usually chopped and cooked with sugar to sweeten, then eaten in a pudding like texture or put into pies and other desserts. The flavor combines well with strawberries. Note: the leaves are toxic and should not be eaten. Rhubarb plants have long green leaves and reddish leafstalks that are edible when sweetened and cooked. Choosing: Look for rhubarbs with firm, fresh stalks and perky leaves. Buying: Rhubarb is sold by the bunch and you can look for them at your local farmer's market. 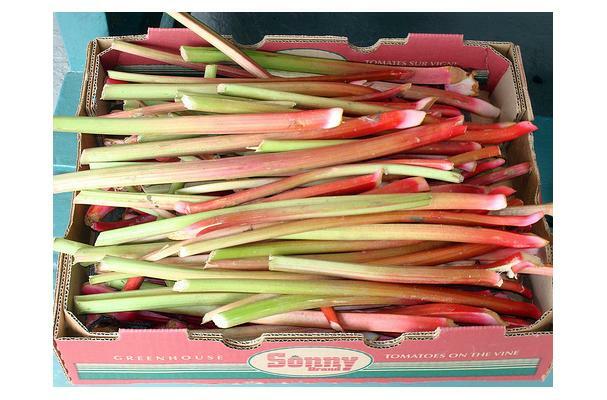 Procuring: Rhubarb is a cool season, perennial. It requires temperatures below 40 F to break dormancy and to stimulate spring growth and summer temperatures averaging less than 75* F for vigorous vegetative growth. The Northern U.S. and Canada are well suited for rhubarb production. In the United states it grows best in the northern states from Maine south to Illinois and west to Washington state. Once planted, rhubarb plantings remain productive for 8 to 15 years. Look for rhubarb with firm, fresh stalks and perky leaves. Cleaning: Wash the stalks and remove the leaves. Rhubarb leaves contain oxalic acid which is toxic to humans. Rhubarb, if not used immediately, can be stored by refrigeration, caning, freezing or drying. It is best to cook them within 2-3 days of buying because they can wilt easily. Keeping the leaves on can help keep the rhubarb's freshness is not used immediately. History: Records show that the rhubarb was cultivated in China at around 2700 BC for it's medicinal value.